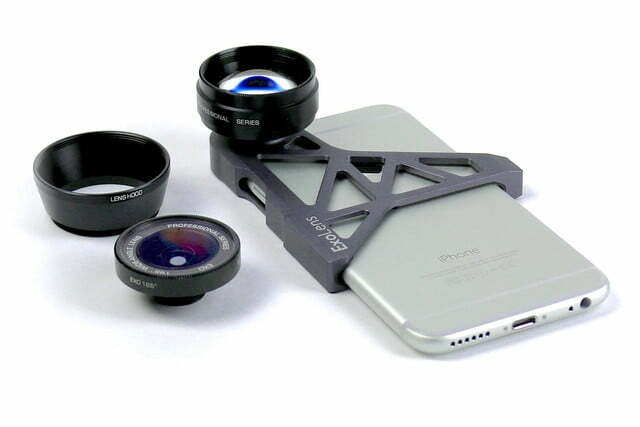 Billed as a “professional photography and videography tool,” ExoLens is a new add-on lens system for the iPhone 6. 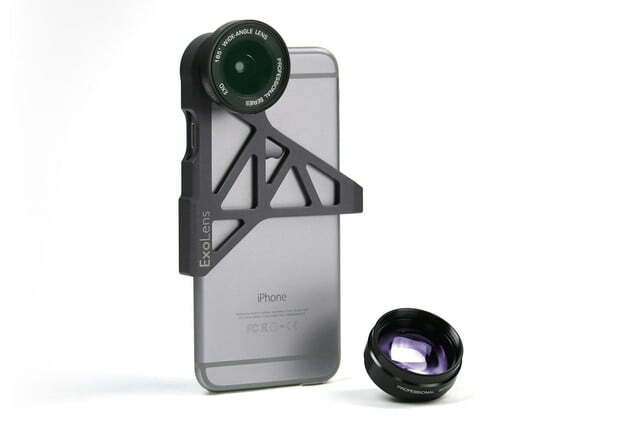 With a machined aircraft-grade aluminum bracket that fits over the iPhone, ExoLens lets you screw on either a wide-angle lens or 3x zoom lens over the smartphone’s built-in fixed lens. According to ExoLens CEO John Willenborg, “Apple came to us two years ago looking for a higher-end lens system for their upcoming devices. The goal was to engineer something that reflected the quality and precision of the iPhone 6 with the power of a mini DSLR.” Hence why it’s an Apple Store exclusive. Of course, calling the iPhone 6 a mini DSLR is a bit of a stretch, but it borrows the same concept of interchangeable lenses. The iPhone 6 has one of the best cameras in the iPhone’s history, and ExoLens is leveraging that with its optics. The Telephoto 3x Lens extends the iPhone 6’s 30mm focal length to 90mm, letting you magnify a scene while still using the device’s autofocus and other features. The 165-degree Wide-Angle Lens gives the iPhone 6 an action camera-style fisheye lens, letting you take in more of a scene. 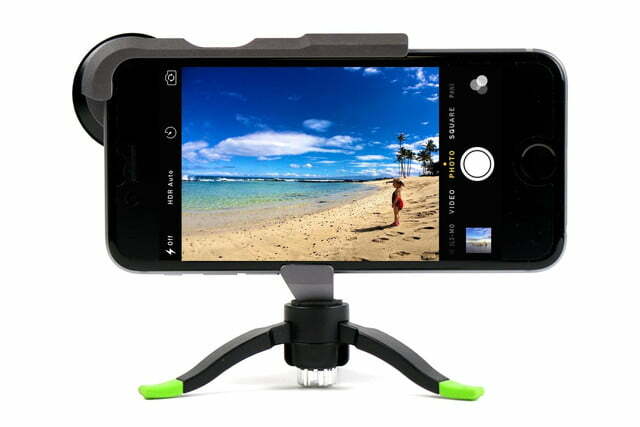 The bracket also puts a tripod screw on the phone, so you can attack it to a tripod for a steady shot. In addition to the two lenses, the kit comes with lens caps, a lens hood for the telephoto lens, and a microfiber lens bag that only has enough room to fit one lens. Since it isn’t software dependent, you can use any camera app. The ExoLens can be purchased via the Apple Store for $130 – not exactly cheap, but the company stresses the “premium” build quality. A version for iPhone 6 Plus will be available in May 2015. (From left to right) iPhone 6 camera, ExoLens Wide-Angle, and ExoLens Telephoto. We’ve had a chance to play with the ExoLens. The metal bracket is extremely solid and well made, but there are plenty of sharp corners. The lenses also have a high-quality build. 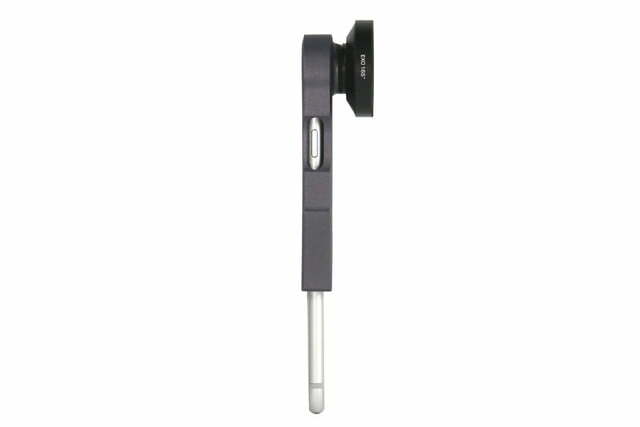 But being that the components use metal parts, the ExoLens does add some heft to the phone. The bracket slips over the device easily, and gives it a secure hold. The wide-angle lens does capture a lot more of a scene, but it does add that fisheye effect where the corners are rounded. The zoom also works as advertised. Unlike actual interchangeable lenses of a DSLR, these add-on lenses merely overlay on top of the existing lens. While they do change the view, they aren’t improving the sensor and don’t necessarily enhance image quality (some might even say they degrade the sharpness). With that said, the ExoLens system works as it’s suppose to (although the images from the telephoto look like they’re warping inward, and edges look fuzzy if you view at full size); images do look good compared to those from many other add-on lenses we’ve seen, but they look a bit blurry around the center of the frame (check out more ExoLens’ sample images here). Unfortunately, as you probably guessed, the ExoLens is made exactly to fit an iPhone 6. 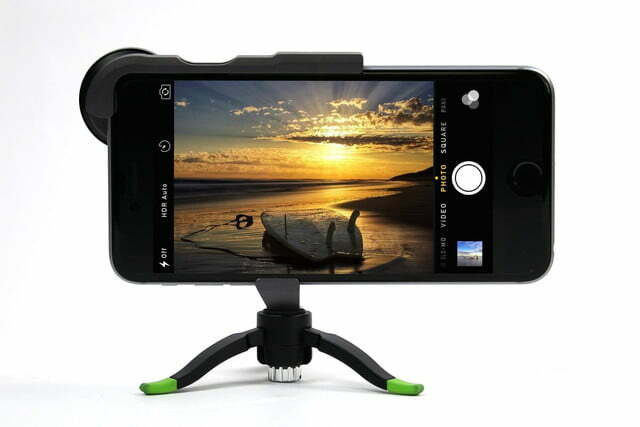 We do wish it was adjustable so that it can fit on older iPhones or the larger iPhone 6 Plus, but we understand it’s designed for a more secured hold (unlike the Olloclip lens system that simply fits over the corner). Another issue is that it can only be used with the iPhone without a case; this is annoying if you use one of those cases that are difficult to remove, and the bracket isn’t designed to protect an iPhone (it’s also unwieldy to hold). Unlike Olloclip, the ExoLens only has two lens options, but being that lenses are interchangeable, we imagine there’ll be more glasses in the near future.